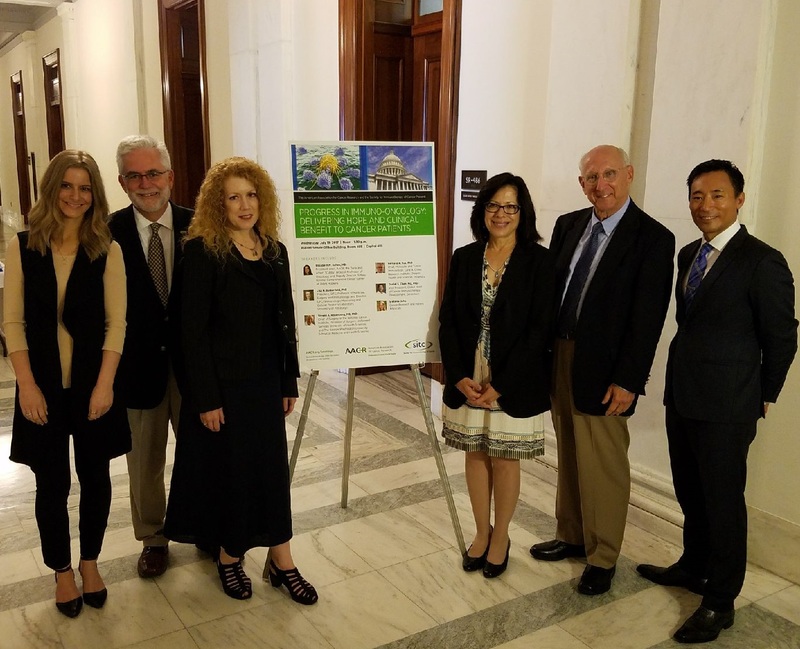 SITC leaders represented cancer immunotherapy researchers on Capitol Hill Thursday, Sept. 14, 2017. 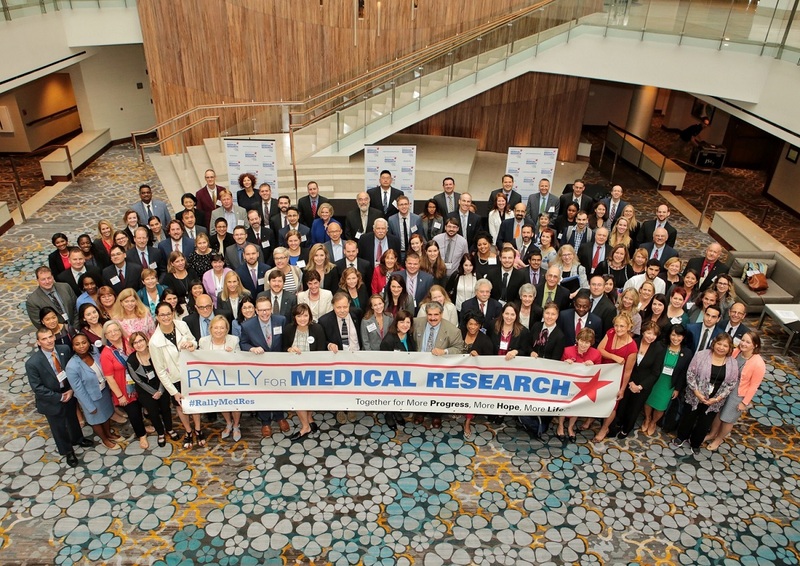 SITC Executive Director Tara Withington and Policy and Advocacy Manager Jacqueline Smith participated in the Rally for Medical Research, a national advocacy movement seeking to ensure policymakers prioritize funding for the National Institutes of Health (NIH). The NIH is a part of the U.S. Department of Health and Human Services, the nation’s medical research agency. Withington and Smith represented SITC alongside representatives from more than 300 national organizations who seek strong Congressional support for scientific research. It is the mission of SITC to improve cancer patient outcomes by advancing the science, development and application of cancer immunology and immunotherapy through our core values of interaction/integration, innovation, translation and leadership in the field. The goal of the Rally for Medical Research is to ensure Congress provides the NIH with a $2 billion increase for Fiscal Year 2018 – a total funding level of $36 billion. Participants in the rally also promoted a bipartisan agreement to raise the budget caps, which would allow Congress to support robust, sustained and predictable funding increases for NIH into the future. For additional information about the rally, download this flyer or view this fact sheet. Wednesday, July 19, 2017 – Noon-1:30 p.m.
One of the most promising areas of cancer research is the field of immuno-oncology. Scientists are discovering new ways to arm a patient’s immune system so that it can attack cancer cells, and the result has been one of the most transformative approaches to cancer treatment that has ever entered the clinic. For many patients, cancer immunotherapies are already providing life-saving results where other treatments had failed or were not viable. But realizing more breakthroughs in this area and broadening the scope of cancers that can be treated with immuno-oncology requires a sustained, federal investment in cancer research through the National Institutes of Health and the National Cancer Institute. The American Association for Cancer Research and the Society for Immunotherapy of Cancer were pleased to host a briefing that highlighted exciting innovations being delivered through immuno-oncology, illustrated the hope that these advances are bringing to patients and noting the challenges that still need to be overcome so more patients can benefit from these revolutionary treatments. Briefing speakers included: Speakers for this Congressional briefing included: Lisa H. Butterfield, PhD – SITC President; Elizabeth A. Jaffee, MD, President-elect, AACR and Past SITC Board Member; Steven Rosenberg, MD, PhD, Chief of Surgery at the National Cancer Institute and Past SITC Board Member; Bernard A. Fox, PhD, Past SITC President; Chief, Molecular and Tumor Immunology, Earle A. Chiles Research Institute; Daniel Chen, MD, PhD, Vice President, Global Head of Cancer Immunotherapy Development, Genentech; Co-Chair of the SITC Industry Committee; and Stefanie Joho, cancer research and patient advocate. For a full recap, watch the YouTube stream of the briefing embedded above. Also, following the briefing, AACR and SITC leaders hosted a live event via the AACR Facebook feed, to answer questions and discuss the day's impact. The Society for Immunotherapy of Cancer (SITC) strongly opposes the proposed budget cuts to federal scientific research agencies as outlined in the Administration’s recently published fiscal year 2018 budget request. This proposal calls for a reduction in funding for the National Institutes of Health (NIH) by $5.8 billion or roughly 20% of its total budget. If applied proportionally across NIH, funding for the National Cancer Institute (NCI) would be curtailed by nearly $1 billion. If enacted, these cuts will jeopardize years of progress being made on accelerating cancer research, education, prevention and treatment. Read more of this SITC statement in Press Releases. On March 23, 2017, SITC joined 26 other organizations in a letter directed to leaders of the U.S. House of Representatives in strong opposition to the proposed repeal of the indoor tanning tax that was included in the American Health Care Act (AHCA).